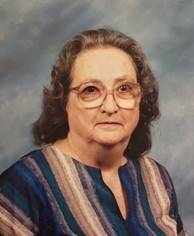 Florence McCulley Moon, of Jacksonville Beach, Florida, passed away peacefully at her home at the age of 90 on Wednesday evening Nov. 21, 2018. Florence was born in Jacksonville on April 5, 1928 and resided in Jacksonville Beach since 1950. Florence was a member of the Eastern Star, she enjoyed raising her children and enjoyed many generations of families, kids and friends, all whom knew and loved her as Mama Moon. Her 4 children, John Robert Moon, Jr., Richard Lee Moon, Daniel Ray Moon and Lori Lou Moon, as well as 8 grandchildren and 15 great-grand kids survive her. Family and friends are invited to attend a memorial service at Quinn-Shalz Family Funeral Home at 11 AM on Saturday, December 15, 2018 located at 3600 3rd St S, Jacksonville Beach, FL 32250.